Engagement has become such a ubiquitous word in the event and meeting industry, but what does it really mean? We asked planners what they understood engagement to be, and we received many different descriptions. For some it meant providing the attendees with tools to give feedback. To others it was connecting their attendees through mobile applications. There were live Tweets and Instagram posts, and everything in between. Engagement seems to mean a lot of different things in our planning world. Reviewing the feedback, we understood that planners simply want opportunities to connect attendees with the event, their brand and each other. Seems simple, right? Next we asked how planners could control or manage engagement, the brand and the attendee experience through the engagement process. For some it seemed that developing custom event apps was the path, allowing for strict control of the experience. Take a peek at a previous blog post addressing event apps here. Many respondents favored the use of Twitter and Instagram for interactions pre-, during and post-event. Live Tweeting a #.... during the event has grown in popularity and is cost-effective. In the conversations we learned however that these engagement tools didn’t result in greater attendee numbers or increase in revenue. It did however create awareness within their community. We then took a deeper dive into Eventinterface and explored how planners used the engagement tools that are part of the software solution to enhance their events. The Eventinterface engagement tools encourage attendee communication, data sharing, networking and connecting pre-, during and post-event. We noticed that planners who promoted the functionalities of Eventinterface saw a greater increase in overall attendee engagement, and by sharing conference data post event for a fee, increased their event revenue by up to 30%. With the right tools, engagement can lead to increased participation and more revenue for an event at no additional cost. Using Eventinterface as an example, this group implemented a post-conference strategy to share conference presentations and access to the protected online event community for a fee, and raised an additional $9,000 in revenue. The group’s overall stakeholder engagement went from 23% of total membership to 59% of membership. Revenue went up by 30% and participation by 150%. Although engagement may mean many different things to meeting planners, to us it means providing the tools to connect attendees with each other, data and resources, pre-, during and post-event. Doing so will increase participation, revenue and stakeholder engagement. 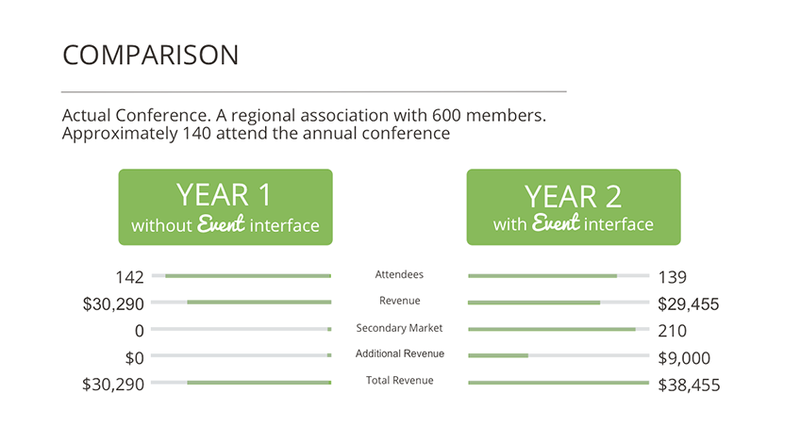 Use Eventinterface for as little as $99 per month. More information about Eventinterface here.